Over the weekend I had the pleasure of attending a girls' getaway with some ladies from my family. As we are all Southern California women, we headed to a local hot spot--Mission Beach. A San Diego community, this location was perfect for our group. For four days we enjoyed the sun and surf, not to mention perfect weather. 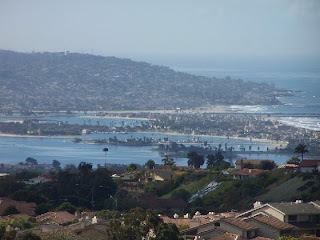 In addition to lounging around and shopping in quaint seaside boutiques, we also had the opportunity to kayak in La Jolla (also a suburb of San Diego). The company that we went with, appropriately named La Jolla Kayak, was fantastic! Our tour consisted of taking the ocean waves head on to get up close and personal with Leopard Sharks, Sea Lions, and Garibaldi (the California state fish). Also exciting, riding the kayaks through the caves and viewing the spectacular mansions that sit along the La Jolla hills. We even caught a peek at the grandiose abode of the Ralphs owner! The kayaking rates are quite reasonable and I suggest partaking in this activity (no matter what ocean you have the opportunity to do so in). Hey Lady! One of my really good friends down here used the same kayaking company this weekend and loved it too. I'm glad you enjoyed San Diego! Call me next time! Beauty Tyrant--I have yet to try white water rafting, sounds scary!! Tiffany--The same company? That's crazy. It was awesome, they did a great job!